For the nursery rhyme, see Pease Porridge Hot. Pease pudding, also known as pease pottage or pease porridge, is a savoury pudding dish made of boiled legumes, typically split yellow or Carlin peas, with water, salt, and spices, and often cooked with a bacon or ham joint. A common dish in the North East of England, it is consumed to a lesser extent in the rest of Britain where it is sold commercially as pea and ham soup, as well as in Newfoundland, Canada. Pease pudding is typically thick, somewhat similar in texture to (but perhaps a little more solid than) hummus, and is light yellow in colour, with a mild taste. Pease pudding is traditionally produced in England, especially in the industrial North Eastern areas. It is often served with ham or bacon, beetroot and stottie cakes. It is also a key ingredient in the classic saveloy dip which consists of a bread roll spread with pease pudding on one half, sage and onion stuffing on the other with a slight smear of mustard, and a saveloy sausage cut in half, which is then dipped gently into either the stock that the saveloys are boiled in or gravy. Only the top half is usually dipped as not to make it difficult to hold or eat. These are still available today in what are known locally in the North East of England as 'Pork Shops'. In Southern England, it is usually served with faggots. Also in Southern England is the small village of Pease Pottage which, according to tradition, gets its name from serving pease pottage to convicts either on their way from London to the South Coast, or from East Grinstead to Horsham. Peasemeal brose, also known as brosemeal, is a traditional breakfast dish in the north of Scotland. In Scotland it is made in the traditional way and usually eaten with butter, and either salt or honey. In parts of the Midlands, it replaces mushy peas as a traditional accompaniment to fish and chips and is thought to be the original side order, only to be later replaced with mushy peas due to a lack of knowledge or availability of the dish. The dish is a traditional part of Jiggs dinner in Newfoundland and Labrador, Canada. In German-speaking countries, pease pudding is known under the name Erbspüree or Erbsenpüree. Alternative regional names are Erbsbrei or Erbsmus. It is especially widespread in the traditional cuisine of the German capital Berlin. The best-known German dish which is traditionally served with pease pudding is Eisbein. In Beijing cuisine, Wandouhuang (豌豆黄) is a sweetened and chilled pease pudding made with yellow split peas or shelled mung beans, sometimes flavoured with sweet osmanthus blossoms and dates. A refined version of this snack is said to have been a favourite of Empress Dowager Cixi. In Greek cuisine, a similar dish is called Fava (Φάβα). Despite the name, it is usually made from yellow split peas, not Fava beans. The mashed peas are usually drizzled with olive oil and topped with chopped raw onions. Indeed, it has been claimed that the early middle English form of pease pudding was consumed by English soldiers during the Third Crusade, and may even have been the forerunner to the more popular hummus. Generally recipes for pease pudding involve steeping soaked split yellow peas in stock (traditionally ham hock stock) and cooking them for around 40 minutes. The resulting mush is then blended with other ingredients, which depend on the variation. 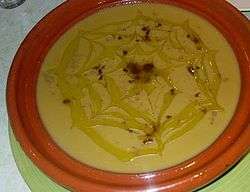 The oldest known written recipe for something similar to pease pudding involves saffron, nutmeg and a little cinnamon in the blending process; modern recipes sometimes beat in an egg at this point to act as an extra binding agent. Pease pudding is featured in a nursery rhyme, Pease Porridge Hot. ↑ Jane Grigson (2007). Jane Grigson's Vegetable Book. U of Nebraska Press. pp. 375–. ISBN 0-8032-5994-8. ↑ "Fava: Purée of Yellow Split Peas". About.com. Retrieved 12 August 2013. ↑ I. Opie and P. Opie, The Oxford Dictionary of Nursery Rhymes (Oxford University Press, 1951, 2nd edn., 1997), p. 345. ↑ MacDonald, George (1872). "25". The Princess and the Goblin. p. 84. Retrieved 16 June 2016.